If you'd offered me a sourdough pancake a few years ago, I've no doubt I would have had trouble composing my face (to not screw up my nose). I wouldn't have even wanted to try it. That was before I discovered sourdough itself, of course, and when I became hooked on the bread I've happily explored other options of sourdough baking. I think pancakes might have been one of the first "non-bread" foods I tried making with my sourdough starter. I've been making these for quite some time now, and while I still enjoy regular pancakes, I absolutely love them made with sourdough. Aside from the wonderful flavour, I always enjoy watching the batter fizz and froth when the bi-carb soda is added - a wonderful reaction to the acidity of the sourdough starter. And I always feel a little bit clever starting the day with breakfast that I organised the evening before. Surprisingly, these pancakes don't have any kind of "sour" flavour. They don't even get the same flavour through them as sourdough bread does. It must be the way they are cooked, or something, but they maintain a very subtle flavour. They're not cakey like other pancakes, and due to the sitting overnight they feel much better in my stomach too. 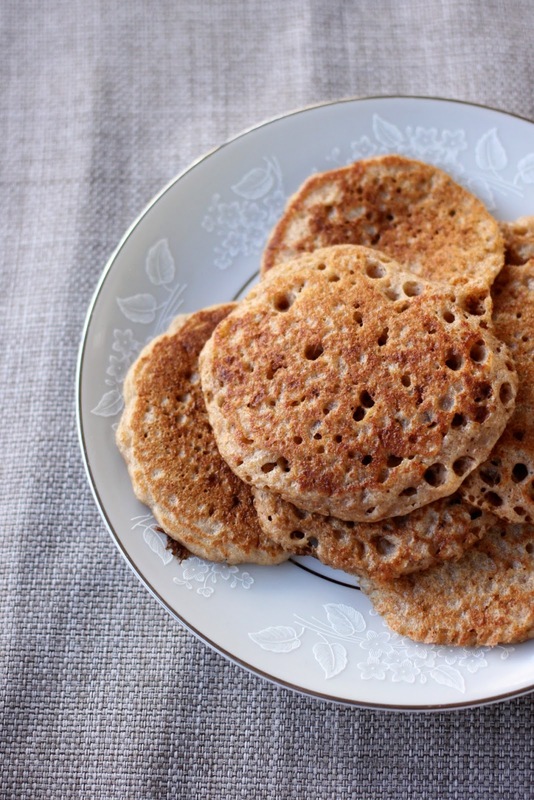 Notes: I've showcased these pancakes made on spelt, as that is what I use, but feel free to use whatever kind of sourdough starter and flour you have available. If you don't have a sourdough starter, that recipe for creating a spelt starter is included in my eBook. 1. The night before you want to eat the pancakes, mix together the flour, starter and water. You may need to adjust the amount of water depending on the consistency of your sourdough starter. Mix the pancakes to the consistency of a thick batter. Cover and leave overnight - if the weather is cool, leave it on the bench and if the weather is hot, pop it into the fridge. 2. In the morning, the batter should be bubbly and have grown a little. Whisk in the rapadura and salt, adding a splash of milk if necessary to thin the batter to a pancake consistency. 3. Heat a pan to medium-high and butter well. Just before beginning to cook the pancakes, whisk in the bi-carb soda. The batter will fizz and froth, doubling in size almost instantly. Drop spoonfuls of the batter into the pan.You know that they're ready to turn over when they have bubbled, and then the bubbles have burst. Flip and cook for another minute or so on the other side, or until nicely golden. Enjoy warm with your favourite pancake toppings! *If your starter is mature (i.e. 4 months of older) and activates reliably, you can use it cold and inactive from the fridge. If using inactive starter, leave the pancakes on the bench overnight, even during warm weather. I made these with my regular sourdough starter and half wholemeal spelt and half plain organic flour (I didn't use 100% spelt as I didn't want my kids to reject them outright). They were SO good. And I probably needlessly worried abouty kids not liking them - they devoured them with Greek yogurt and fruit. Thank you!